We focus on providing post prom parties with moral entertainment through shows that are provided by strong professional actors. As this generation celebrates the big dance, it's important to make sure that they don't go out and have problems afterwards. Having a strong and fun post prom event can keep the students safe while providing a night to remember. With a variety of game shows, improv comedy and murder mystery dinners available to fit most any need, we can even provide multiple styles of entertainment in one overnight event. It's no wonder that so many organizations and families have looked to us to help keep their kids safe through our programs. The big dance is a rite of passage for high school students as they come ever closer to graduation. Our job is to help see to it that they get to that graduation happy and healthy by keeping them entertained overnight. This prevents them from driving late or being put into morally ambiguous positions. With a variety of improv comedy, game shows, audience Olympiads and murder mysteries, there is no shortage of options. Most of these can directly involve the kids in the activities helping ensure that they will want to hang out and engage with their friends in these activities. By combining some of these events, we can actually entertain for longer periods of time and we can offer discounts for multiple bookings. After all, if our host is there playing a murder mystery, shifting gears to host a game show isn't as difficult as doing the two events separately. With family-friendly entertainment and formats that can fit almost any audience or venue, look to us for your entertainment needs. 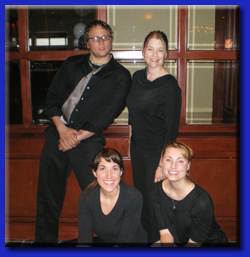 With a collection of improv comedy game shows and murder mystery dinners, we work with you to develop a program that will meet your needs within your budgetary constraints. We talk to you and ask about the people that will be coming to the graduation party, the venue that you have chosen, the budget you have and what you are looking to achieve. This helps us to ensure that your group will have a good time. This includes the top cities such as Los Angeles, San Francisco, Austin, Dallas, Houston, Chicago, Milwaukee, Minneapolis, Boston, New York, Miami, Tampa, Orlando, New Orleans as well as everywhere else in all 50 states. We are especially strong in the MidWest and New England and look forward to working with you!